Summer Preparations – Your Roots Are Showing Dearie! The sign that the indecisive lingerings of Winter are finally gone, and you can put away that ergonomic snow shovel for the last time. and, my favourite, the family vacation, which is really a genealogical research road trip! My curious look answered her, as she pointed to The Smiling Wall. “Everyone’s graduated!” she beamed, as I slowly realized what she was talking about. “What do we do now?” I asked her. She looked at me and beamed brighter with a wider smile. [Aside: I still haven’t figured out what that means.]. — then there is the anticipated arrival in late September-early October of two more grand-rabbits. Yes, twins, which should bring eye-opening excitement to the next generation of Rabbit parents. Aside from the assortment of birthdays, there are not any weddings or family reunions this year, but MiLady and I will have a quiet celebration for our 11th wedding anniversary. (That’s if you call spending the day at the annual amusement park, a quiet celebration.). We are still contemplating if we will take the day off or the week off for other activities. My deepest apologies, but I am so excited about August. 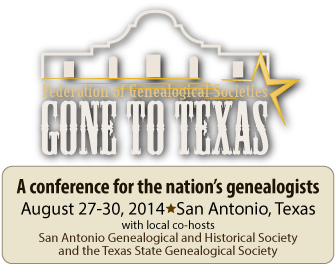 The 2014 FGS Conference is in San Antonio, Texas, and I so wish that I was able to go, but Nostalgia has volunteered to go in my stead! Now, I am not sure if this is a very good idea, but it does mean The Rabbit Household will be a Nostalgia-free zone for about a week! To update “HER” Conference status, I braved the worst, last night, and started a conversation with the Old Banshee, as she laboured over her packing lists. Yes, “lists” plural. “Will you warn them in advance, again?” I teased, remembering her mistake last Halloween. THAT got a reaction out of her! There was a loud SNAP, as her head jerked up and her eyes zeroed in on mine. Nostalgia looked over her eyeglass rims like Canada’s near-extinct research librarians. “What are you babbling about, now?” she asked. “The Pirate Queen will be conducting another audience with Her Court,” I stated matter-of-factly. I smiled wide. I had her! “But, you said you were done, Gia.” I smirked to myself. Instantaneously, my cell began vibrating. Standing in the hallway, I pulled my phone from my pocket and smiled when I looked down at the screen. It was the all-familiar smiling photo my beloved soul-mate, sending me yet another romantic — or just maybe, a rare and more suggestively adult — text.